Tension has been high in Wisconsin for nearly a month as a result of Governor Scott Walker’s proposed budget. A major issue with his proposal is that it makes it mandatory for public employees to pay higher percentages of their medical and retirement plans. In addition, unions would only be able to use their collective bargaining rights to increase salaries accordingly to inflation rates. To get increases higher, they would need to have a voter referendum. Not surprisingly, the people of Wisconsin were not pleased with the proposal and are protesting the passage of it. 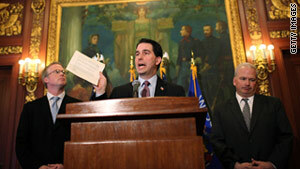 Walker has been refusing to negotiate with Democrats to find middle ground on the issues. The governor was adamant that the proposal would be best for the state financially in the long term. But the people of Wisconsin say the hit is too hard on them right now. However, Walker’s team has been talking to Democrats via email about potential ways to end the standoff and come to terms on a budget that both sides can agree with. In the email, there were numerous compromises discussed. One of the points made was that unions could fight for salary increases past the natural inflation rate without having to go through a voter referendum. Also, they could fight for other financial issues like overtime, bonuses, and issues pertaining to school, certifications, and licenses for certain jobs. In addition to police officers and firefighters, employees at the University of Wisconsin Hospital and Clinics Authority would also keep all of their collective bargaining powers. Public employees could also negotiate safety concerns, but not hours, overtime, and time off. Democrats also sent a letter to Walker asking for compromises on public defense, medical, and the Department of Corrections and the private bar. The letter also makes it clear that Wisconsin is not in as deep of an economic hole as Walker is making it seem. It is true that Wisconsin is set to be short $137 million at the end of the fiscal year, which will come at the end of June. However, the areas where Walker is looking to save the money would result in an attack on the middle class. The majority of the public employees effected by the proposed budget would be middle class citizens who at the very least deserve to have the collective bargaining power that they have had up until Walker made his proposal.